Bishop Paul Tighe from Ireland is the Secretary. He was born in 1958 and grew up in Navan and Sligo, graduating from University College Dublin in 1979 with a degree in Civil Law. 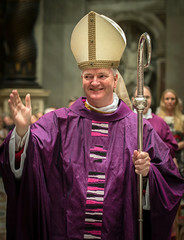 Having studied for the priesthood at Holy Cross College, Dublin and at the Pontifical Irish College in Rome, he was ordained a priest of the Dublin Diocese in 1983. His first appointment was as parish chaplain and teacher in Ballyfermot. Subsequently, he studied Moral Theology at the Pontifical Gregorian University and in 1990 was appointed as a Lecturer in Moral Theology at the Mater Dei Institute of Education in Dublin and at Holy Cross College. He was appointed head of the Theology department in 2000. In 2004, he was named as Director of the Communications Office of Dublin Diocese. In 2005, he established the Office for Public Affairs which aimed to promote the engagement of the Diocese with public institutions and civic society. In November 2007 Pope Benedict XVI announced his appointment as Secretary of the Pontifical Council for Social Communications. He was appointed titular Bishop of Drivastrum and Adjunct Secretary of the Pontifical Council for Culture by Pope Francis on 19 December 2015. Pope Francis nominated him Secretary on 28 October 2017.